These Vaultz mesh medicine bags are wonderful! 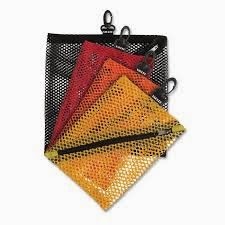 Basically, they're mesh bags with a crosswise zipper. They come in all sorts of colors so that you can accessorize. The crosswise zipper means that as soon as you unzip your bag, everything is easily accessible. You don't have to pull out several things to reach the one thing you're after. Since it is a mesh bag, you can easily see which item you're hunting for. Not only that, these have a really durable hook attachment so you can latch them onto nearly anything. Even though these are designed for medications, I found several other uses for them. The best use ever? The diaper bag! We have baby Tylenol and diaper rash cream and a thermometer and baby nail clippers among tons of other small items. Now, I don't have to pull out 20 diapers and 3 outfits of clothing and search through pocket after pocket to find what I'm looking for! It's as simple as pulling out my bag and it's right there! Everything in one easy to you container! These are also amazing for cosmetics in my purse! It's just large enough to fit everything I carry with me, but not so large that it's bulky or takes up too much space. I also keep one in the bathroom. My son likes to use action figures in the bathtub. At the end of his bath, I just zip up the action figures and clip up the bag, so they all get to drip dry and I don't have to worry about mold, mildew, or Batman trying to crawl into any of my body parts while I'm taking a bath! For those of you that take medications, even if it's just ibuprofen, this could be a life saver for you. For those of you who don't, you'll find this to be one of the handiest organizational tools available. No more hunting for small items! Not only that, it's an attractive bag! They can be found in the pharmacy area in Wal-Mart. One lucky reader will win three sets of the Vaultz Mesh Medicine Bags!